We are so fortunate to have so many amazing volunteers. Each month we are lucky enough to have lots of new volunteers join our community, after just that first time for most they are hooked. Every so often we get a new volunteer that just immediately feels like a part of the family, like they have always been with us. Well, this is the case – but multiplied by two, for Tom and Kitty. Humble, hard working, and so very dedicated – Tom and Kitty were both indispensable from the start, Tom assisting with Water Safety and Kitty at the Equipment Tent. Aside from being sweet, amazing people who have done so much for us, they are also sponsoring lunch for all of our Wounded Warrior Day at the Beach events for the year. We could go on and on about these two, but we’ll hand it over to Kitty to share their AccesSurf story. 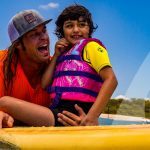 My husband Tom and I have been volunteering for Access Surf for almost two years now. Both of us, for the Day at the Beach, every first Saturday and I am also blessed to be able to help each month at Wounded Warrior Day. We knew when we moved to Oahu, we wanted to give back but weren’t sure exactly how or with whom. Fortunately through a co worker of Tom’s, (a Country Crue member) we found out about AccesSurf. I am certainly no surfer. My time in the water is occasionally spent on an SUP, wearing my safety vest in case I fall into the water that I can’t swim in. It’s why you’ll find me volunteering under the equipment tent and not on a board. This is where I see firsthand the impact that Access Surf has on its participants. I get to greet each of their smiling faces as they check in and get their gear before hitting the water. And when they’re finished, I see them bursting with excitement as they come back by to me and hand over their salt water logged green rash guards and vests. This is the most special day of the month for them and I get to be a part of it. The participants aren’t the only people on the beach on those days that are overwhelmed with the raw emotions that AccesSurf generates. The first day we volunteered, Tom came home after working on the Water Safety team and proceeded to cry in the shower as he reflected on what he had just been a part of. 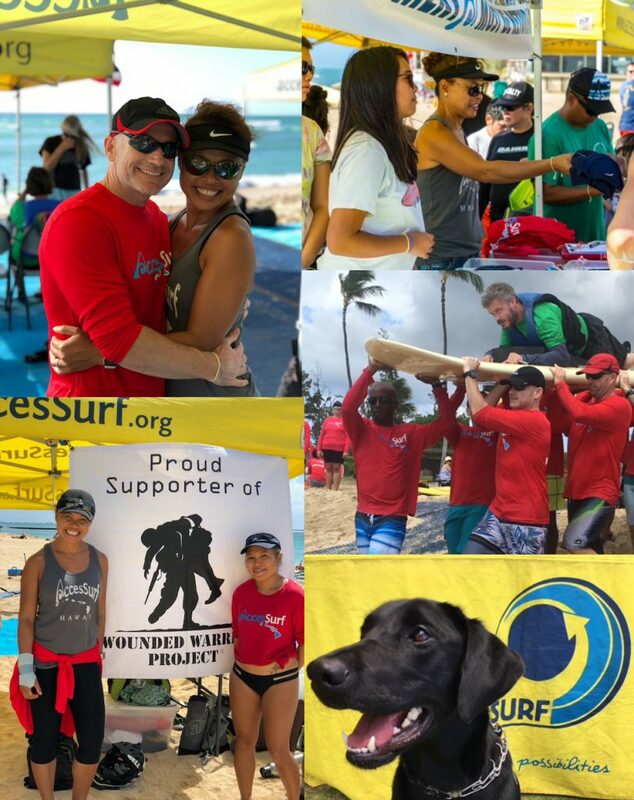 For those who participate, their parents and loved ones, the volunteers that donate their time and energy, there is something very special felt by all of us that AccesSurf has created through the power of giving and its undeniable spirit of Aloha. Tom and I are both so grateful to be a part of the AccesSurf family. And we are so grateful to you BOTH for being such a dedicated part of the AccesSurf family. THANK YOU!